GDPR has been a real pain for most of us. For me I’ve loved it for 2 reasons. First, I have been able to remove myself from 10s of emails lists that I didn’t want to be on. Fantastic. Second, it showed me just how few of my clients/friends/business contacts were using an email management program. I have explained Maichimp more times than I’d like to count this past month. But, this is a bonus. It’s given me a great opportunity to build some bespoke training into my services and offer it to everyone I know. As always I sometimes forget that what I find obvious in using tech, isn’t so obvious to everyone else. To kick off this new training, I thought we should start with a biggy that people tend to get wrong at the start of using Mailchimp. How they create their lists. You do not need a new list for every group of emails you have. Or for different types of subscribers, or for people who love blue and drive trucks. If you’re like me, the giddy excitement of using something the first time (and let’s be honest the pain of learning it) sometimes causes us to take short cuts. The easiest and least head hurting way. Yep I did it too the first time around. I just kept building a list each time I needed to send an email to a new group. Building a list is pretty easy with Mailchimp. Building it so it works for you, keeps things organised, and make life easier in the long run… Takes a little bit of time and effort. The biggest problem with doing it this way? 6 months down the line you find out that you have 10 lists, 2200 email address of which maybe 20% are repeated, and suddenly Mailchimp wants some money because your’ve crossed the free 2000 threshold and you have no idea who or where anyone is. We will look at how we build these from 2 perspectives. The one I described above, where you are using Mailchimp but are lost in the sea of confusing list names and repeats. We will also discuss how to do this from scratch, yep day one. Do it right when you start and life becomes so much simpler. So for you giddy impatient people.. Let’s start with how we export the lists we have. Mail chimp makes this easy. Oh wait, but, before you do, let’s think about how you will mange these lists afterwards. What am I talking about? Groups. Otherwise known as categories for your people. Everyone pay attention here please. You are essentially creating categories for this master list. Everyone is on the main list, but you can filter by these groups. Every business is different, and you should take a little time here to think about how many different ways you can organise your emails. Think about things like how they found you, if they’ve made a purchased, if they are a current or past customer. My own lists consist of 3 groups (categories) right now, and within the group there are a few group names (subgroups). I’ll explain two here. These are people I have worked with and have websites with me. Within this group are my ‘Group Names’ (subgroups) where I split things up further. I work closely with a graphic designer M:art and he manages some clients through his business and I manage others through mine. I also have a subgroup for all clients who have taken out a monthly maintenance plan with me. I’ll only briefly explain this one. I spend a lot of time writing plugins along side of my web design. I offer some of these for free, from the above you can see how I am organising my email list. And yes, some of my email contacts fall into both groups. One last example from one of my clients who runs ski courses. She has just started taking her 15 lists and pulling them into a Master list. Here are her Groups. The power of these lists is how they help you when you create your emails and campaigns (to be covered soon). Say I wanted to email only my clients that pay a monthly maintenance, I can easily filter them now with how I set up my groups. Remember anyone can belong to more than one group. But there is a balance. Do not create 20 groups, when 5 would do. Ok, great, you have your new master list. It should look something like this. Everyone still with me?? Great. See that ‘Manage contacts’ above, click on that and select ‘Groups’ , then click ‘Create groups’, your screen should look something like this. I tend to use checkboxes here as my email clients could belong to more than 1 group name. This is completely up to you and how you run your business. Add a few groups that make sense and remember it can change in the future. Save your group when you are happy and you will then be given the option to import emails to this group. PAUSE HERE. We are going to switch up now and work on getting our emails ready to bring into this new master list, and attach them to groups while we do it! Your emails could exist in several places, such as your Gmail or Outlook accounts, a spreadsheet you manually update, or another marketing program. Gather them all up. At this point it would be very helpful to to think about which emails will go into the groups you created above. Things are going to get good. Unfortunately because there are literally 100s of ways to manage emails, I cannot cover them all here. In short, you need to create a spreadsheet with all of your emails, names, and any other relevant information you want to hold onto. Make sure your spreadsheet has headings that correspond to these details. Such as ‘Email’, ‘First Name’, ‘Address 1’, ‘Favourite Colour’, etc. If you are creating this from scratch for yourself, save it as a spreadsheet (it makes it easier to edit if your need to), then export a copy as a CSV file. This is what Mailchimp will recognise to import. NOTE 1: If you are only importing email addresses and nothing else, skip the above. 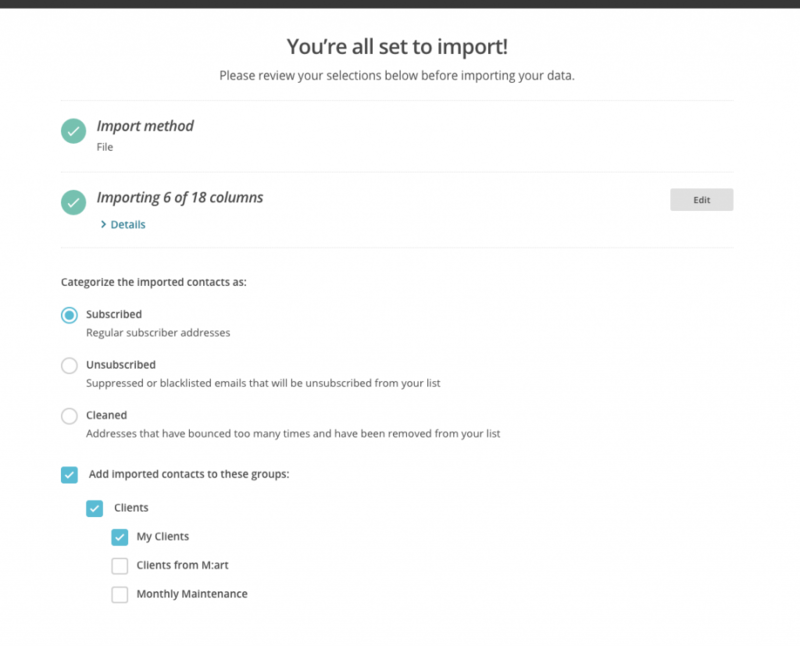 You can copy and paste them directly into Mailchimp in one easy step. 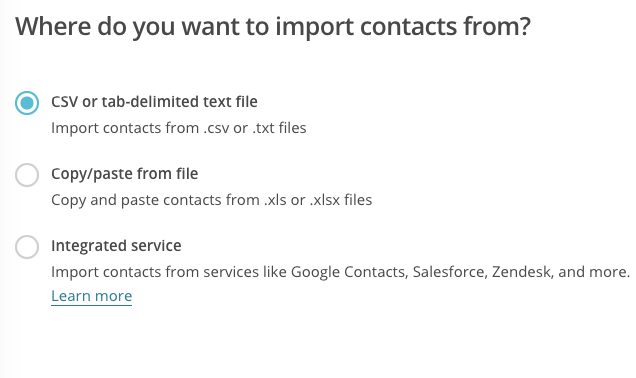 NOTE 2: Most programs (Gmail, Outlook, Leadpages, etc) will allow you to export your contacts. When you do, just make sure you select export as CSV file. Ok, it’s time to start cleaning up those old lists. 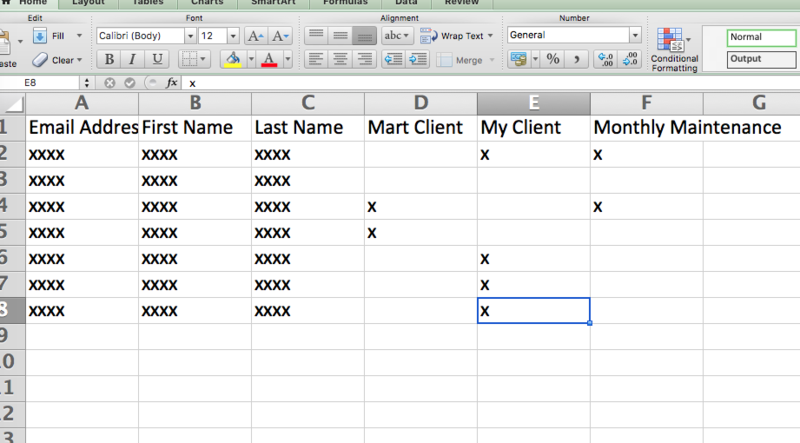 A little note here, keep track of what you called your lists as you export them. Mailchimp names these lists as members_export + numbers of date and time so you will have to remember what you exported when. I suggest changing the name of the file as soon as it’s done downloading. 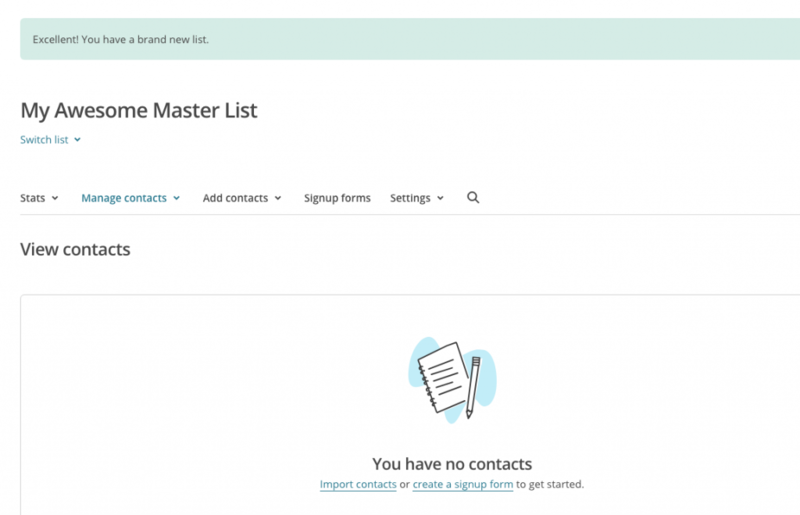 Now, go ahead and navigate to one of your previous lists in Mailchimp. Once your click on the list name you will see a grey button at the top ‘Export List’ click this and wait for Mailchimp to do it’s job. It takes anywhere from a few seconds to a minute depending on the size. If the list is simple Mailchimp will refresh and give you a link to download right away ‘Export as CVS’. 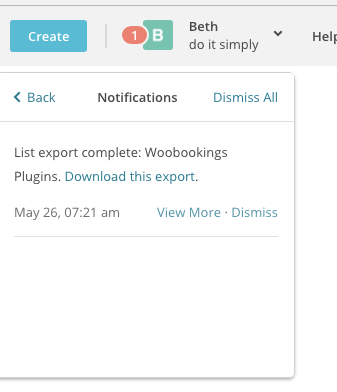 If it is a more complicated list you will receive a notification at the top of the screen that the list is ready to download ‘Download this export’. Once you download that list, rename the file to keep track. If it is a zip file that means there has been activity in that list. Such as bounced emails, unsubscribes, etc. Double click to open and you will see something like this. Cleaned are your bounced emails and unsubscribed are just what it says, unsubscribed. When you go to reimport your lists you are only concerned with the subscribed file. Repeat this for every other list in your Mailchimp account. NOTE: you can ignore the unsubscribed and bounced lists unless you want that for future tracking. If you have a previous list that now nicely belongs to a group (or groups) you just created. Perfect! Start with those first. Click on your new Master List. Navigate to ‘Manage Contacts -> Groups’ once again. You now have some further options. For my new Master list my group is Clients, I click the button to the far right of it that says ‘View Groups’. 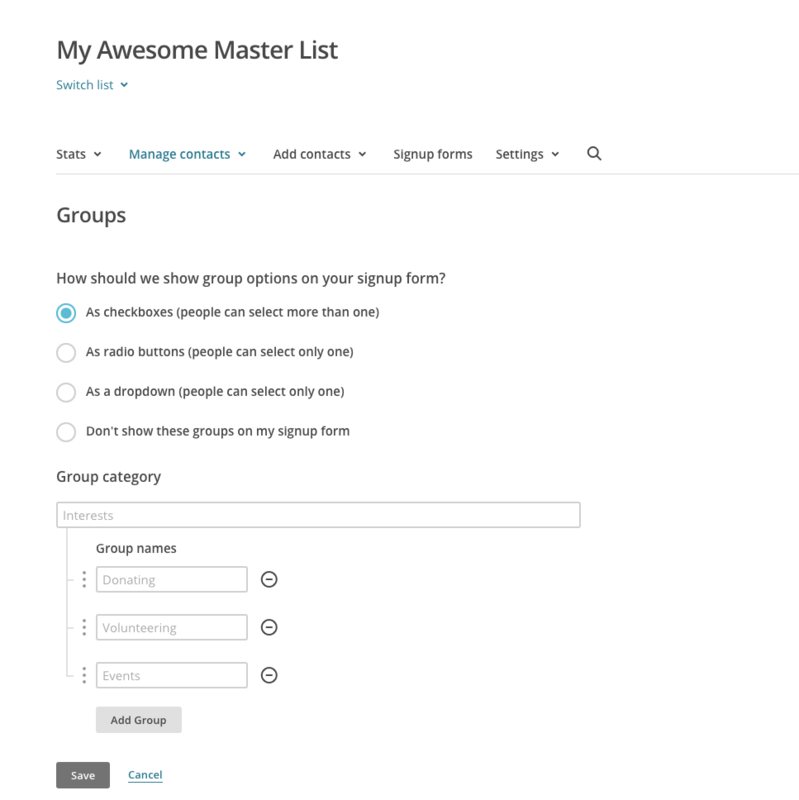 You may have several groups or just one, choose the group you want to import your list to. Once you have hit edit you will see the options for each ‘Group Name’ to ‘Import’, click this and get ready for action. Remember previously I mentioned you could copy and paste emails, here is where you can do it. Choose the second option. For now we are keeping the first option to import from CSV file. Click ‘Next’ and proceed to find and upload your CSV file from on your computer. This could be the bespoke one you created or one of your previous Mailchimp lists that you exported earlier. Once you have selected it, click ‘Next’ again. Now comes a little bit of magic. You will notice below that I have 3 un-matched columns in my bespoke list.. the cool thing here is I could add them to my list as merge fields. If you find some of the ways you want to organise your emails just do not work for groups, you would consider creating List Fields and |’MERGE’| tags. Which is another way Mailchimp allows you to add detail to your email list. This could be attaching a purchase made, or a response to a specific question you asked. I am not going to explain that here (I will in a later post), but remember it’s an option. For now ignore these mismatched fields. The same goes for the import of previous Mailchimp lists. When you import these CSV files there are many columns that do not match. That is because of all of the detail collected from users when they interact with you. As you are staring fresh with your new Master List there are no interaction columns, so you have a mismatch. Unless there is some important detail you don’t want to lose here, you can ignore them all. You could go through the edit process and add the column into your new Master List, but I do not see much advantage. Once you have reviewed all of the columns and skipped where necessary, click ‘Next’ again. More good stuff here. Now you have the ability to put this list exactly where you want it. You are bringing in a list of subscribed people only (or you should be unless you choose to keep the other ones for history’s sake) and then you tick the boxes of the groups they belong in. Pretty awesome if you ask me. Now simple click ‘Import’ in the bottom right of the screen and let the magic happen. Now when you navigate to your New Master List, these group of emails will be there, slotted in nicely to the group you chose. This makes life so much easier when you are looking to send emails or campaigns to a specific group of people. At this stage I would delete the list(s) you previously downloaded (and just uploaded) from Mailchimp. Yes the actual lists in your Mailchimp account. I know it’s scary and it feels wrong, but you just downloaded the list to your computer. You have it I promise. And you hopefully followed the directions above and added them to your Master List. If you found this helpful, please let me know in the comments below. Even more, if you are interested in the full Mailchimp training I am putting together, drop your details in here. I am going to offer some workshop days in the near future and also be publishing a ebook to cover all of the above and much much more. Best of luck and happy Mailing!